Marta Marques and Paolo Almeida won the €300,000 LVMH prize this year. The Central Saint Martins trained duo are London’s shredded denim virtuosos, steadily improving at an impressive rate. For Spring 2016, their love affair with the nineties continued but grungier than we’ve seen from them. There was a gothic element to this one also. Aside from the make-up, the first example was a black leather jacket draped over the shoulders of a model wearing a white dress. The silk jacket and leather shorts that followed were welcoming to any buyer, a fan of M’A or not. A gateway to the brand perhaps, if the brilliant denim isn’t to someones liking. The sheer gown with leaf accents was bordering on a weak Simone Rocha creation. 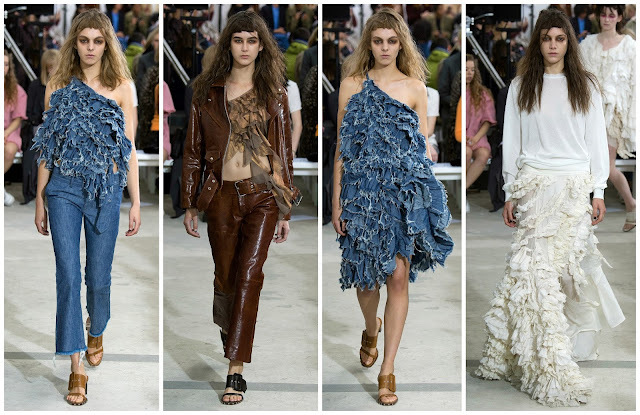 I think the scariest part for attendees (the show was held at a warehouse in north London on the final day of fashion week) were the unexpected gowns. It wasn’t the minds of tired fashion folk playing tricks on them, über feminine gowns did take to the runway. The second look was a loose fit, sheer tank dress with the perfect amount of deconstruction. It insinuated the girl didn’t want a traditional gown and took to the original with a blunt scissors. The result, strangely, was a raw moment of femininity. The third look was angelic. The model glided down the runway in her floor-trailing gown. The bodice was enriched with asymmetrical crepe ruffles. One of the last looks featured a floor sweeping skirt boasting an ample amount of ruffles. The lightweight sweater paired with it added the spirit of the grounded M’A girl. This collection reminded me of the discrepancy between the Disney adaptations of Hans Christian Andersen’s novels, and the source material. If this was another designer, the collection would sickly sweet and frothy. They were frothy here, but in a darker, mysterious way. 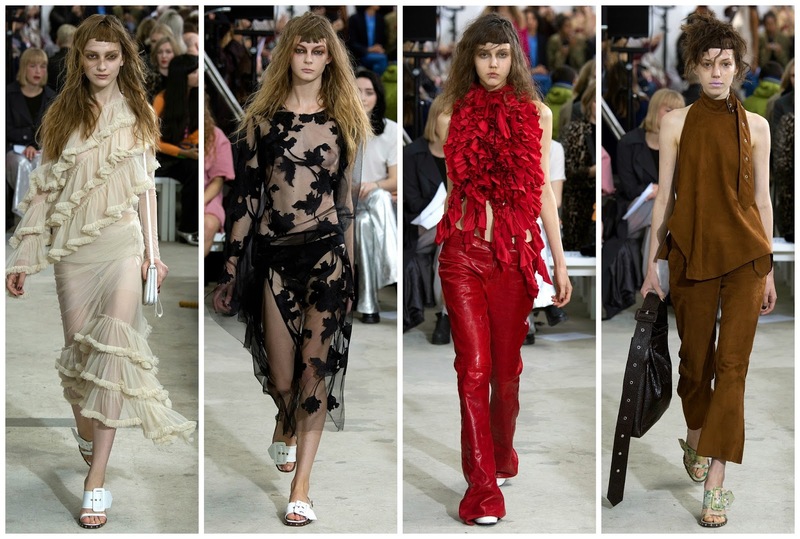 Marques’Almeida portray the honest, harsh side of a fairytale. They show the bleak aspects to things. Bleak but beautiful.